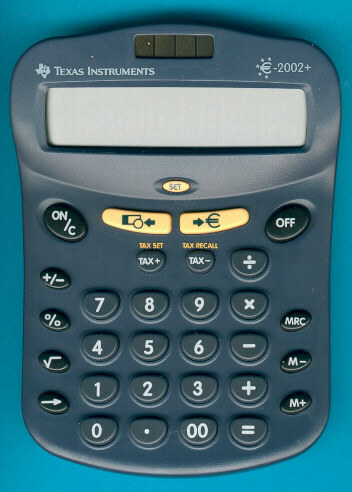 Size: 6.1" x 4.5" x 1.0"
The €-2002+ calculator combines the usual desktop basic calculator functions with an Euro currency conversion. The exchange rate between the Euro and the Home currency is entered with the small SET-key. Two additional keys allow the conversion in both directions. The €-2002+ followed soon the €-2002 and added a feature to set the number of decimal places (for the curious, you have to press the ON/C key about two seconds to enter the F-0-2 menu). A more sophisticated approach could be found in the €-1796 and €-2003, these calculators got the 11 different exchange rates preprogrammed. If you need printing functions, choose among the €-2004, €-2005, €-2006 and €-5032. © Joerg Woerner, January 21, 2002. No reprints without written permission.